detached house of 60 sqm fully renovated and consists of entrance, living room-kitchen (with the possibility of two beds on sofa bed), bedroom (double bed + bunk bed) and complete bathroom with toilet, bidet, shower and washing machine . 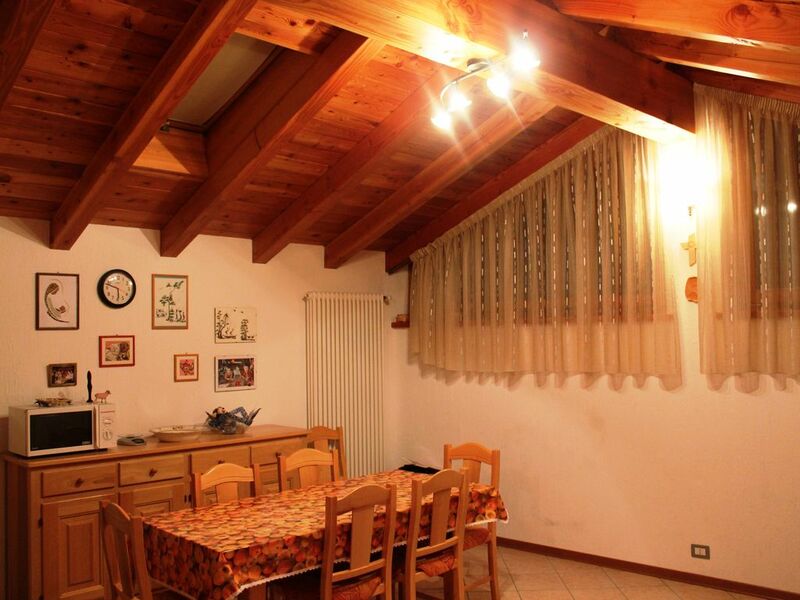 All rooms have a typical wooden roof beams and the living area is especially bright due to exposure at midday. The kitchen is complete with dishes for 12 people, pans and utensils, stove with 4 burners, electric oven, double bowl sink, refrigerator, freezer, microwave. The house is equipped with independent heating system by guests and a wood stove. The access is at street level (the area is extremely quiet) and you can park two cars in the driveway. The house has a garden of 20 sqm ideal as a play area for children and for outdoor dining (barbecue, table and chairs are available to guests). The adjacent cellar can be used as a ski deposit. SUPPLIED: pillows, blankets, toilet paper, kitchen paper, detergents and household cleaning tools. NOT PROVIDED: towels, sheets, personal hygiene products. I proprietari sono gentili e discreti.Ti supportano passo passo quanto basta.La casa e' accessoriata e dotata di riscaldamento notevole,compresa acqua calda sanitaria. The property is located in Arcesaz, a quiet hamlet in the middle of Val d'Ayas, 3 km from the capital of Brusson, easily reachable by car (Verrès motorway exit) or by public transport. In the town there are a restaurant, a bar tobacco, children's play area and a 5 football field. Arcesaz is an excellent starting point for skiers direct Estoul-Palasinaz (11 km), Col de Joux (11 km), Antagnod (13 km) and Champoluc (14 km). Sportsmen who prefer cross-country skiing, they note the slopes of Brusson and Estoul-Palasinaz. The location is ideal for hiking and mountain biking enthusiasts. Le tariffe sono soggette a modifica finché la prenotazione non sarà stata confermata.